In one of my original posts about a LOL Surprise dollhouse that I made for my friend's daughter, I said that there were two little girls I knew who liked the dolls. 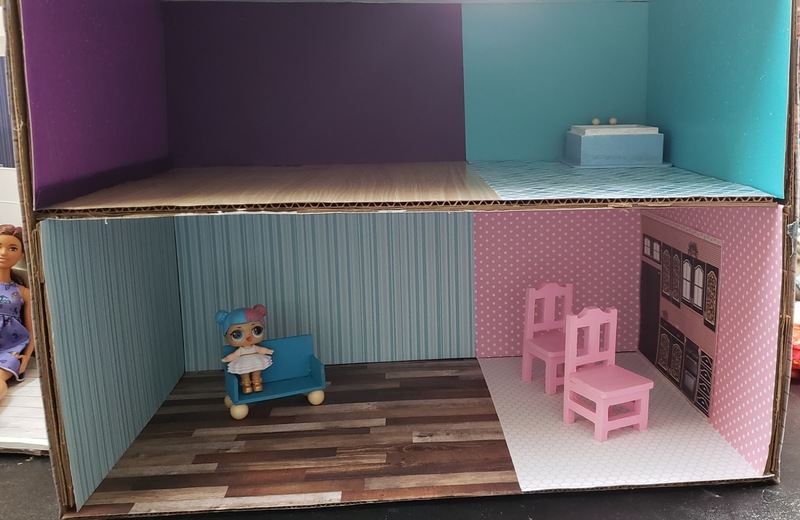 The other is my niece, and although I wanted her house to be ready for Christmas as well, I kept putting it off. To be fair, we didn't get to see the extended family and exchange Christmas gifts until March. Some of you will remember that the entire BTEG family had a yucky cold through the Christmas holidays, and so we didn't want to spread our germs around. Then came a joint birthday party for the niece, and great-nephew, who have birthdays very close together in January. The three of us wanted to go down to Youngstown, OH for the day, but I think we were still a little wiped out from illness, and the high that day was about 16 degrees F, or about -9 C, so we were a little uncertain about taking a long trip in that kind of cold, anyway. Finally, Mr. BTEG's sister threw a surprise birthday party for her husband, earlier this month. Their daughter is our niece, who was getting the house. We made it to the party, and after most of the partygoers had left, their family and ours exchanged very belated Christmas gifts. Now, let's talk about the house. I had some good ideas making the furniture this time around. Above, you see Stacie sitting next to what the store called plaques. I'm pretty sure these are generally used for decoupaging or painting or adding some sort of decoration to the front, to make a sign or message to hang on your wall. I painted these, added foamcore rectangles covered in muslin to the flat top, and they became beds. You could add a headboard, footboard, and feet, too. Of course, these particular pieces are only good for very small dolls. Below you see the house in progress, and in front, a bathtub, chairs and a table. The bathtub and table were originally a box with a lid. 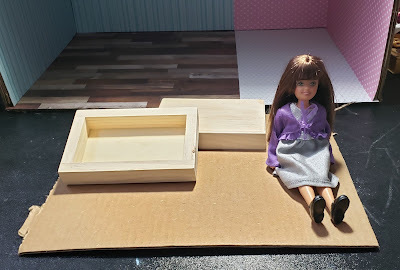 The box itself became a bathtub, and the lid got legs added to it to become a table. The chairs were from a hobby store. I attached two beads to the "bathtub" for knobs, but I couldn't get a piece of wire to stick well enough for a faucet. 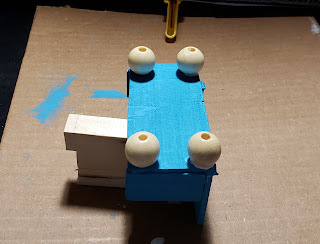 My work was not the best, but I used four pieces of balsa to make a couch with armrests, then painted it and attached four beads to the bottom for feet. 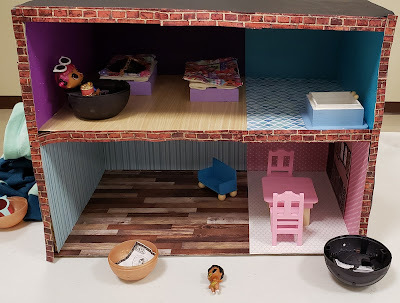 And below, the house completed and given to my niece. I had a hard time attaching the brick scrapbook paper strips to the front of the house. And I wasn't able to do careful cutting to the blankets that I sewed together with white fabric to make a blanket and flat sheet, and they weren't the same size. I ran out of time through procrastination (how often do crafty people do that?) I also learned that cardboard can warp a lot more than I thought it could, and that it was hard attaching something else to the sparkly scrapbook paper that I bought. But my niece got excited just taking the furniture out of the bag we presented it to her in, and was thrilled with the house. That makes it definitely worth it. She opened the two genuine LOL Surprise dolls that we also gave her and started playing with it right away. I hope she has fun dolly times with it. That is absolutely adorable! It makes me want to try to make one myself. Thank you! You should try it. I am learning more every time I make one about working with all the various materials and paints. Awww, that is so cute. I am glad that your niece loved the gift. Thank you! It's nice to make the younger set happy. It's a really cute house! I think the bathtube turned out really well. Your niece is very lucky. Thank you! I think she's a great kid. I particularly enjoyed how creative you were with re-using the little box etc. Well done ol' girl!! I've been happily married for over twenty-five years. I have two grown-up daughters, and a son-in-law. We also share our home with two black cats and a bunny. I like to knit and sew, both clothes for my family, and clothes for my dolls. 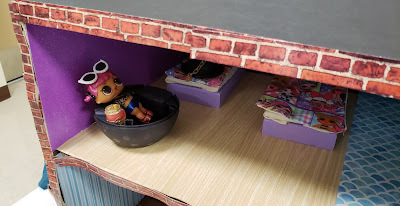 My dolls get things in modern and vintage style. I'm an amateur fashion historian, and it's easier to sew a Victorian dress for a doll than it is for me! I'm BarbEvilKnitter on Ravelry, if you are a fellow knitter or crocheter. I'm on Pinterest as Barb Evil Genius. I run two doll blogs and a personal blog where I talk about whatever moves me. Click my profile if you want to find one of my other endeavors. Battle of the Tiny Cars! 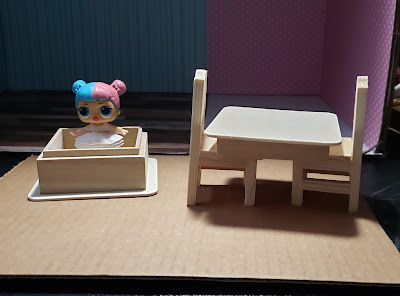 I have a DollsAhoy Custom!